The train known as "The Beast" passes by the Sagrada Familia shelter in Apizaco, Mexico. For many migrants, the train is the next step in their journey north. Selvin arrives at La Sagrada Familia, as part of his journey from Honduras. He is one of thousands of Hondurans escaping one of the world's most violent peacetime countries. 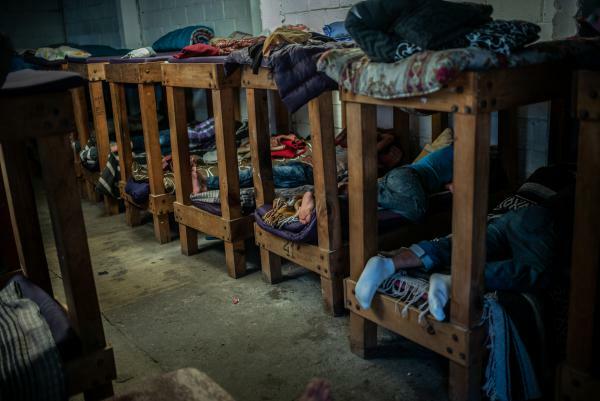 Central American migrants rest in a shared room for men only at the migrant and refugee center. A map of Mexico shows routes to the U.S. border, but the Trump administration's "zero tolerance" immigration policy has left many migrants stuck in Mexico. 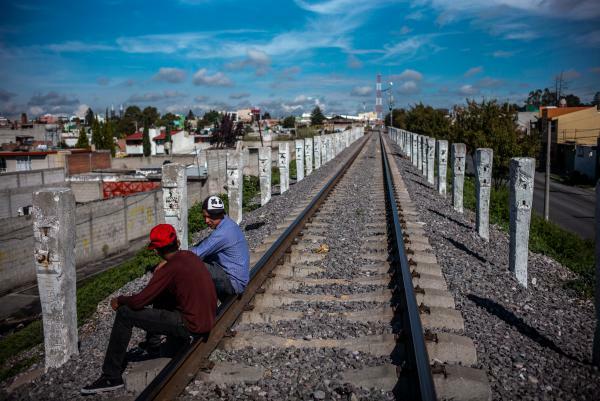 Two Central American migrants rest on the railway through which La Bestia crosses near the Sagrada Familia shelter. 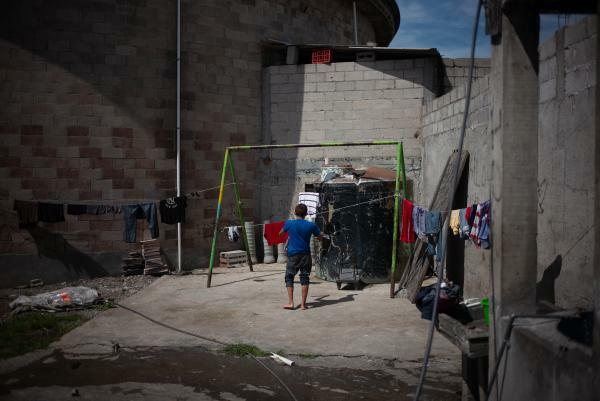 Migrants risk the danger of jumping the train "because they're fleeing poverty and have to make this journey with practically no money," says Sergio Luna, the director of the shelter. 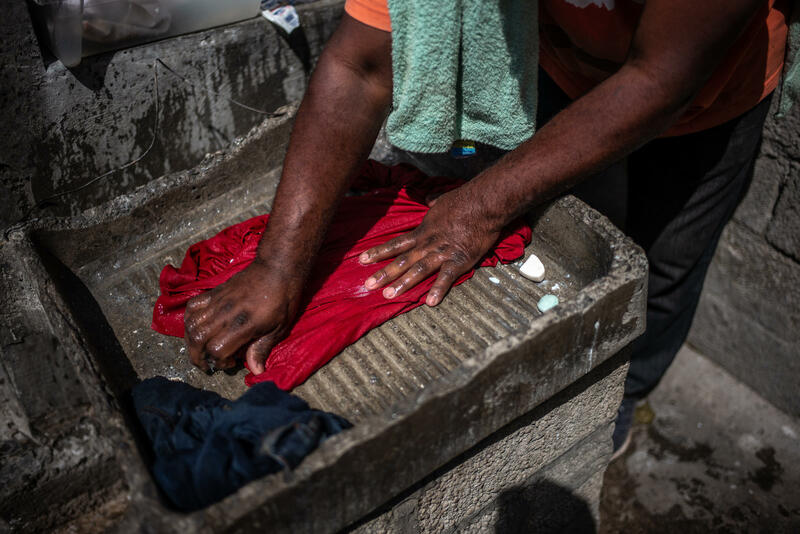 A Central American migrant washes clothes at the shelter. Experts estimate that 400,000 Central Americans enter Mexico as migrants or refugees each year. 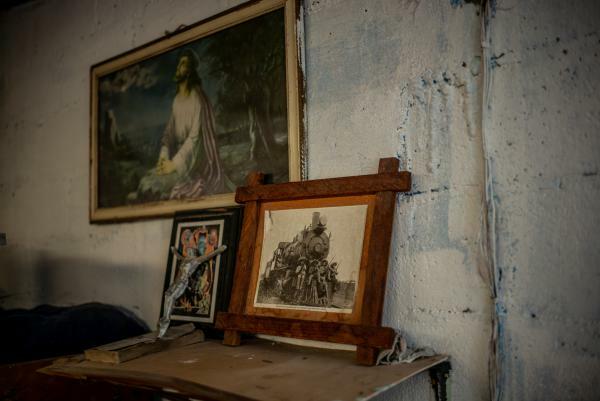 A photo of Mexican revolutionary leader Emiliano Zapata is displayed in one of the bedrooms in Sagrada Familia, one of more than 100 nonprofit migrant shelters like it across Mexico. 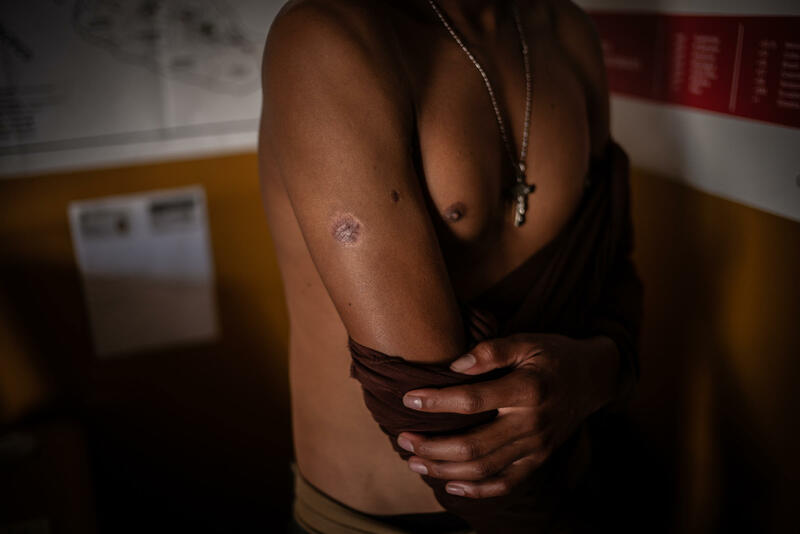 Jerdin, a 25-year-old from Honduras, says he was shot by a private guard from the company that runs "The Beast" train. Salvadoran migrants clean off after a week of traveling on "The Beast." 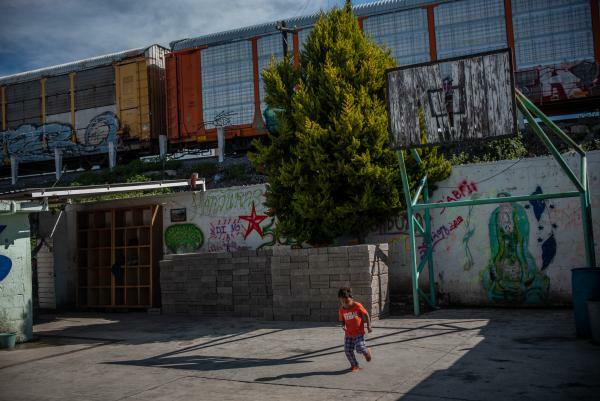 "A trip by train is tremendously difficult and dangerous; migrants are abused in southern Mexico primarily by criminal groups," a shelter director says. 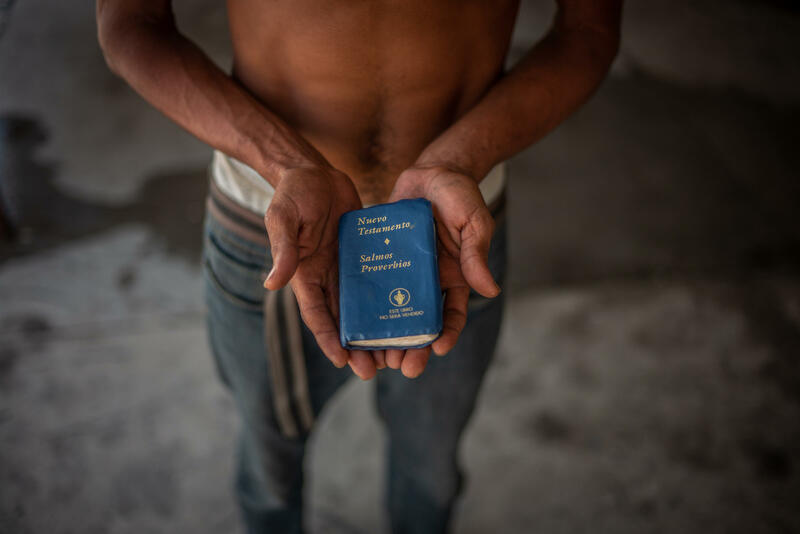 Selvin holds a Bible, which he says is the only thing that hasn't been stolen from him. It's his "weapon against darkness," he says. A Central American migrant hangs his clothes at the refugee center Sagrada Familia. As migrants and asylum-seekers decide whether to risk the effects of the Trump administration's "zero tolerance" policy, Mexico's role as a possible destination country for Central Americans becomes more important. A young Honduran woman, who asked NPR not to use her name because she has been threatened back home and in Mexico, watches her two children buzz around the classroom. "We had no other option but to leave," she says. She is one of thousands of Hondurans escaping one of the world's most violent peacetime countries, which has been ripped apart by bloody gang conflict. She brought her two children along Mexico's terrifying migrant trail by herself, months into her third pregnancy. She is due in August. But this tremendous risk was worth it because all her attempts to find safety in Honduras failed. "My ex would beat me," she says. "He was jailed after I reported it. But from that moment on, he's been threatening me." In Honduras, she moved to a new house. He was released from jail and found her there. She moved again. He found her again, even angrier that time around. He threatened to kill and mutilate her, and her pleas for protection for the children fell on deaf ears. He said he would kill her in front of them. She set out from Honduras with a plan: to reunite with extended family in the United States and request asylum. If she could get there quickly enough, she could be around her family to give birth. But those plans were shattered. "Now I'm really thinking through what to do since the president is taking kids from mothers," she said of the Trump administration's family separation policy, which the president has now overturned through an executive order. "I've been doing everything to protect my kids, and if they were to take them from me, that would be the worst possible thing." After an intense public outcry, on Wednesday, President Trump replaced the policy of separating children from their parents after catching them crossing the border illegally with a policy of detaining the whole family together. The new plan raises questions about whether or when the children already separated will be reunited with their families. Earlier this month, Attorney General Jeff Sessions decided to narrow the grounds for asylum, putting in doubt whether the Honduran woman in this Mexico City shelter would be eligible under the new rules. Many migrants are wrestling with the administration's changing immigration policies, says Sister Magdalena Silva, who runs the migrant shelter. "They're waiting to see how Trump reacts and what he decides to do from day to day," she says. "In some way, they're trying to measure what the impact of his policies could be for them." As migrants and asylum-seekers decide whether to risk the effects of the Trump administration's "zero tolerance" policy to prosecute all adults caught crossing the border illegally, Mexico's role as a possible destination country for Central Americans becomes more important. The number of people seeking asylum in Mexico in 2017 was almost seven times higher than the total in 2014, according to government data. This year is on track for even more. "But Mexico has not invested in its refugee program," says José Knippen, who leads the immigration and refugee program at the Mexico City think tank Fundar. The Mexican government's refugee assistance agency has a 2018 budget of just $1.3 million and only has 15 protection agents in the entire country responsible for making decisions on more than 7,000 pending asylum claims, she says. Silva says there are never enough resources for Central Americans fleeing violence. "We officially have space for 30 to 35 people, but there are 80 in here right now," says Silva of her nonprofit shelter, which is funded primarily by the Catholic Church, the United Nations Refugee Agency and civil society groups. It does not receive funds from the federal government. It's one of the few full-service shelters in Mexico at which Central Americans can stay indefinitely. While it has tight security, it's an open-door shelter; families can come and go. It has an informal school for the youngsters and gives some vocational training to adults. It offers free legal and mental health services. "Mexico is a destination country for some people, but it can't be permanent for many because organized crime also travels with them and can find them here in Mexico," says Silva. This was the case for the pregnant Honduran mother of two at another shelter in southern Mexico. "Someone called my mom [back in Honduras] and told her they had figured out where I was and that my ex was coming to chop me into pieces," she says. Risking it all on "The Beast"
Two hours east of the capital, in Apizaco, Tlaxcala state, a group of migrants runs to jump on the freight train known as La Bestia ("The Beast") to continue their journey north. A woman, scared to jump on herself, gets on a man's back, and he tries to run both of them up to speed for the train. As he grabs a ladder on one of the cars, he gets pulled down by the momentum of the train. He and the woman go tumbling, their limbs just inches from train grinding the tracks. They're scraped and bruised. "People do it because they're fleeing poverty and have to make this journey with practically no money," says Sergio Luna, the director of the Sagrada Familia migrant shelter two hours east of Mexico City. He says there are more than 100 nonprofit migrant shelters like it across Mexico. "A trip by train is tremendously difficult and dangerous; migrants are abused in southern Mexico primarily by criminal groups," he says. Sexual assault, theft and kidnapping are a regular part of the migrant route. And it has become even more treacherous as Mexico's enforcement has clamped down, deploying local, state and federal police plus the army and marines to support immigration officials in stopping migrants. 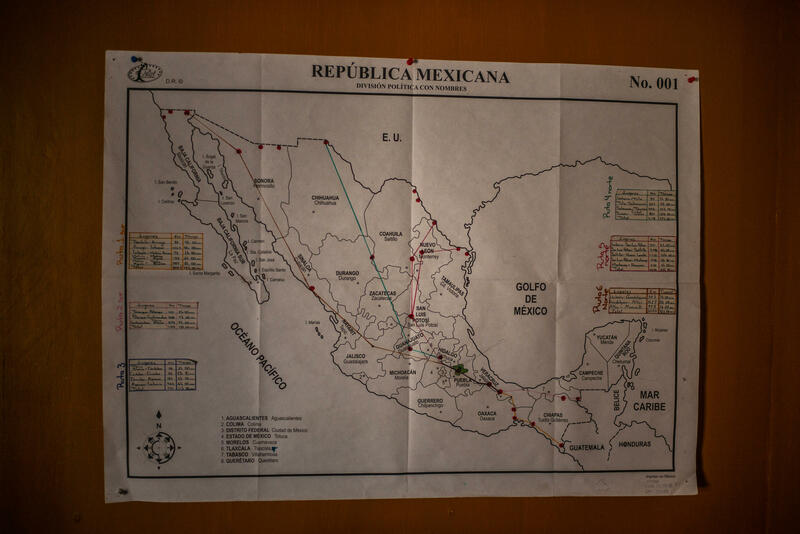 Luna and other migration experts estimate that 400,000 Central Americans enter Mexico as migrants or refugees each year and that as many as half of them are detained by Mexican authorities. As the number of people seeking asylum in Mexico has increased, so have deportations. Mexico deported more than 78,300 Central Americans to their home countries in 2017, according to the government's immigration department. 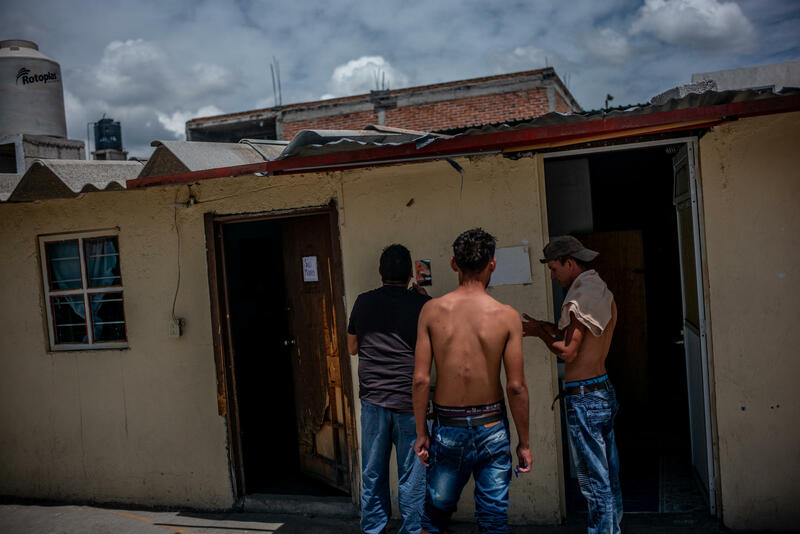 From January to April 2018, Mexico's deportations of Central Americans have increased more than 50 percent, to almost 35,000, compared with the same period last year. Mexico has been a loyal collaborator with the United States on immigration, stopping hundreds of thousands of Central Americans en route to the U.S. But that hasn't eased U.S.-Mexico tensions over immigration. "What Mexico was doing on immigration never seemed to be enough for the Trump administration," a former senior U.S. official with knowledge of Mexico told NPR, asking not to be identified to be able to speak candidly. With Mexican presidential elections on July 1, the question now is what the next government will do on immigration. Polls show leftist Andrés Manuel López Obrador is the overwhelming favorite to win. He plans to change the way Mexico enforces immigration policies. "After the victory of our movement, we will defend all migrants in the American continent and all the migrants in the world," he said in a speech on Tuesday. "Military and police force will not be used to repress the [migrant] population," says Alfonso Durazo, López Obrador's public security adviser. "We will primarily use diplomatic channels with the origin countries of these migrants to reach some kind of agreement." As furor over Trump's zero tolerance policy hits Mexico — as illustrated by a June 21 protest outside the U.S. Embassy in Mexico City — the next president may feel pressure to act. "Trump's immigration policies could force López Obrador into a corner," the former senior U.S. official told NPR. The new government may "take their foot off the gas" on migration enforcement, leading to even more tense relations between the countries. What's clear is that migrants and asylum-seekers will not stop coming, says Sister Magdalena Silva from the Mexico City refugee shelter. "The numbers will keep increasing," she says. "It's not only the situation of violence and poverty [in Central America], political crises in places like Nicaragua and Venezuela mean that even more will keep coming." But many of them, like the pregnant Honduran mother of two, feel trapped between violence at home and "zero tolerance" in the U.S.
"My family in the U.S. keeps telling me to be patient and that God will open doors for us," she says. "We're human beings with feelings, and our children are our life." The audio version of this story was produced by NPR's Peter Breslow and Samantha Balaban and edited by Jordana Hochman.